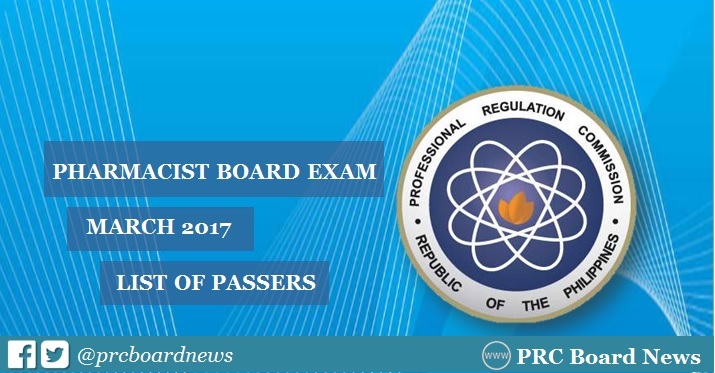 The Professional Regulation Commission (PRC) and the Board of Pharmacy officially released results of March 2017 Pharmacist board exam in 2 working days after the examinations. The complete list of passers, top 10 (topnothers), top performing schools and performance of schools are available on this page as announced online. UPDATE: 2,426 out of 3,732 passed the Pharmacist Licensure Examination. The first Pharmacist board exam this year was conducted on March 9 and 10, 2017 in the cities of Manila, Baguio, Cebu, Davao and Iloilo. Pharmacist board exam covered the following subjects: pharmaceutical chemistry, pharmacognosy and practice of pharmacy (March 9); pharmacology-pharmacokinetics, pharmaceutics and quality assurance/quality control (March 10). Based from PRC Resolution No. 2016-1019, the target release date of Pharmacist board exam results is on Wednesday, March 15 or in 3 working days after the exam. In January last year, exam results were released in just 2 working days. A total of 1,487 out of 2,710 passed the exam. In June 2016, results were out online also in 2 working days. PRC named 1,406 out of 2,784 who have passed the series of tests. We advise takers to monitor results starting Tuesday, March 14. Here's the overview of Pharmacist board exam in the past three periods. PRC said that University of the Philippines (UP)-Manila topped the schools with 100% passing rate or 54 examinees passed the series of tests in March 2017 exams as per Commission Resolution No. 2010-547 series of 2010. Saint Louis University (SLU) was recognized as the top performing school in the January 2016 Pharmacist Licensure Examinations. Meanwhile, San Pedro College - Davao City was the only top performing for June 2016 Pharmacist board exam.